With its turbocharged engine and sizzling yellow-to-red paint scheme, the Saturn SCX three-door coupe ignited the passion of performance-car enthusiasts. The SCX's 1.9-liter DOHC 4-cylinder engine was modified by Saturn Motorsports of San Diego to yield an estimated 300 hp, more than double the engine's normal output in the Saturn SC2. Along with its hot engine, the SCX boasted a high level of handling and sporty appearance cues that reflected the car's performance capabilities. "The Saturn three-door coupe has been growing in popularity among young buyers who want to personalize their vehicles," said Steve Girard, total vehicle planner for the Saturn S-Series. "The Saturn SCX concept car demonstrates to this market that you can do a lot with the coupe’s powertrain and vehicle chassis." Girard said the engine work by the motorsports team, in conjunction with the San Diego Saturn retailers, shows how Saturn benefits from a close partnership with its retailers. Saturn Motorsports of San Diego has developed performance ideas for its own racing team and also works with Saturn owners looking to rev up the performance of their vehicles, providing both parts and expert advice. The SCX's engine featured custom-made JE Pistons, JG Engine Dynamics turbo head, JC Sports big bore throttle body and Crower rods. Jet-Hot high-temp metallic ceramic coating reduced the extreme temperature within the header and turbo housing. A hood-mounted dual air induction system helps with additional engine cooling and adds to the overall appearance of the vehicle. 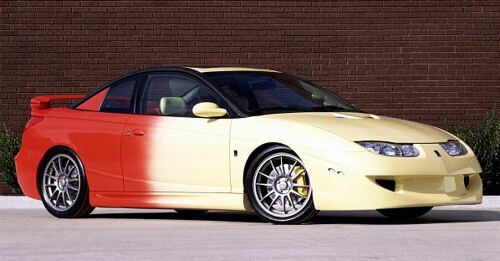 The car's dramatic paint scheme, created by special vehicles builder MSX International, began at the front with bright yellow – a color featured on a run of limited-edition coupes – and transitions to red, one of the most popular three-door coupe colors. The exterior look owed its brilliancy to an application of a crushed-glass coat that reflects light. Consistent with the paint were BF Goodrich Scorcher high performance tires, featuring full-tread-depth color ribs that are yellow on the front tires and red on the rear. The yellow-to-red theme was also picked up inside the car, with the car's seats and door panel inserts. The interior also rocked with a Kenwood DVD/CD/TV system, with a screen that retracts into the head unit and a 400-watt Alpine amplifier. The bold look was augmented by ground effects designed by MSX, including front and rear fascias and rocker moldings. Other sporty touches included 18x7-inch alloy Superleggera wheels from O.Z. Racing, and carbon fiber roof rail and carbon fiber interior accents. A B&B stainless steel muffler and custom stainless steel exhaust with Mozart 4½-inch stainless steel single exhaust tip delivered maximum performance and a sharp look. The SCX's handling was been enhanced with front and rear adjustable coil-over-shock suspension and sway bars from The Progress Group. To help control the car's power, it was outfitted with Stainless Steel Brakes 13-inch rotors and four piston calipers up front, and 12-inch rotors in the rear with two piston calipers. The SCX also featured a rear spoiler with a dual-wing look. There are currently 15 users and 387 guests online.